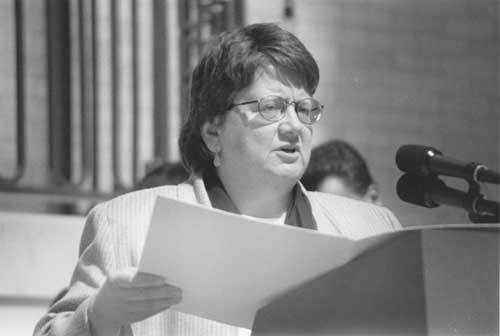 Liz Malia served as Chief of Staff to former Massachusetts State Representative John McDonough for eight years before she ran for office. Q: How did you come to be involved in politics? A: The one thing that is sort of basic is that I’ve gotten into gay politics indirectly through a general interest in political issues overall – being involved when I was younger particularly. The irony is that I was more-or-less involved with Catholics involved in social justice issues. I started to get involved in the political scene – the anti-war movement – while I was in college. Coming out, I didn’t initially get involved in terms of issues in the gay community, but, very gradually, over a number of years – going to the local gay pride marches – in the mid-80s started to get interested in more organized politics. There was a lot starting to cook in Massachusetts at that point in time, so I had a chance to work starting at a really grassroots level in my own neighborhood with an activist Democratic Ward Committee. When I got involved there, there were a number of gay men who were active in that committee. It was a very diverse group – Black, White and Latino. And right around that time there was a push started to get the human rights legislation passed through the state legislature, so it sort of found me as much as I found it. I became involved in terms of an expression, I guess, of my own interests. I guess that piece is kind of interesting to me when I think back on it. Some folks have a much more conscious introduction I think – my interest in progressive issues led me into it. Q: Was there something specific that really hooked you? A: There was a formative experience for me, again in the mid-80s, when I got involved with state politics. I was a co-founder of a group trying to open things up a little bit called Bay State Gay and Lesbian Democrats. We were working with the Democratic Party, which was a relatively progressive bunch of people compared to other parts of the country. But, we were having a lot of trouble getting support from what we saw as our natural allies, from the Democrats. So a few of us cautiously got involved in the state democratic party. There was a state convention at which 25-30 of us from across the state focused on getting language in the state Democratic Party Charter Preamble that recognized gay and lesbian issues as a human rights issue. We were kind of green and new at it, but we figured out what we had to do. The piece that still sticks in my mind clearly was the experience of going to the State Democratic Convention in Springfield with a few of us trying to collect signatures to get a motion on the floor to add gays and lesbians to the charter. We had a lot of allies, but people were not quite ready to talk about it, and it was not within the comfort level at that point for the organized Democratic machine – much like everywhere. The challenge was to get our motion onto the floor so we could get a vote on it and get it discussed in an open forum on state party policy. In order to do so, we really just had to go out and talk to all the other delegates. We had put together a “GAY VOTE” hat that, really, I kind of shudder when I look at it now – it was pretty hideous – one of those political hats that was lavender and it said GAY VOTE right across the front of it. This was not an issue on a lot of people’s radar, by choice I think. You had to be prepared for a really broad range of responses. I was amazed at how much real support there was. We got enough votes to get the piece on the floor. We didn’t win. We felt like we didn’t win the battle, but I think, ultimately, won the war. It was sort of a watershed for a lot of us. It was the working together and getting the support we needed from ourselves and from other folks, and really identifying that as a necessity. And basically just saying, “Look, we are here. Were not going to go away.” The awareness we worked to focus on was that most of the activists in the party knew a good number of us because we were all active in different candidate’s campaigns. We all had track records of being activists, loyal Democrats, we were members of the party and we had worked on all kinds of issues together. I think one of the things that was a real challenge was to prompt folks to look at it and ask, “Are we now going to not acknowledge the issues these folks are bringing forward as Democrats?” and to do it honestly with the party we belonged to.